This majestic White Oak tree, 30 metres high and with a circumference close to 500 cm, is quite possibly one of the oldest and largest Quercus alba specimens in Canada. The tree was nominated jointly by Linda McKay of the Burlington Horticultural Society and Jane Irwin of the Burlington Historical Society for recognition under the Ontario Heritage Tree Program. The two BHS groups – the ‘Hort’ and the ‘Hist’ – together represent almost 150 years of community activity in Burlington. The city-owned oak, now standing by the north shore of Burlington Bay on Allview Ave, is estimated to be at least 300 years old. This oak is one of Burlington’s Honour Roll trees. Its nomination was supported by Burlington’s City Forester Rick Lipsitt, who has worked with the Burlington Horticultural Society over many decades to create and maintain the Honour Roll of heritage trees. Burlington was the first city in Ontario to develop its own honour roll tree program in 1975, which was based on Ontario’s honour roll program, a Centennial project in 1967. 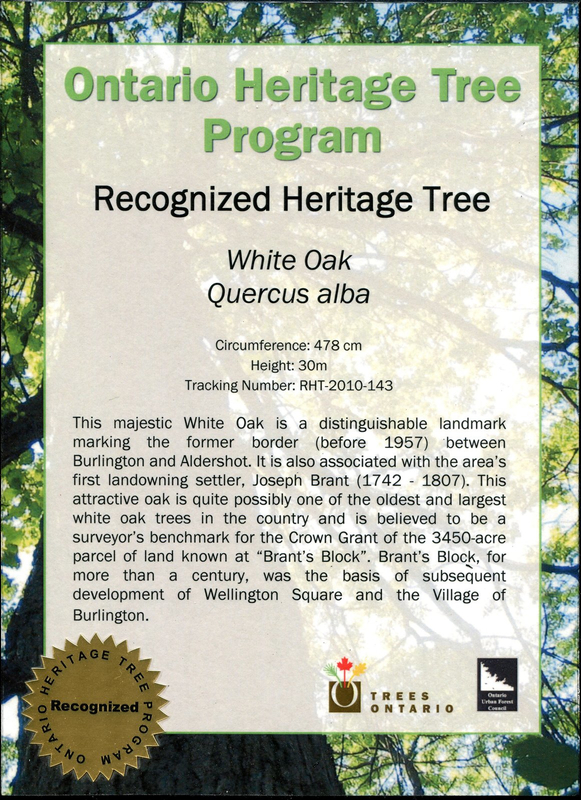 This White Oak was a surveyor’s benchmark in 1789 for a treaty arranging the purchase, for the British Crown from the Mississaugue nation, of a block of land that soon afterwards became the 3450-acre parcel of land known as ‘Brant’s Block’. For more than a century, Joseph Brant’s Block was the basis of the subsequent development of Wellington Square and the Village of Burlington. Until 1957, the tree and survey line defined the border between Aldershot and Burlington.